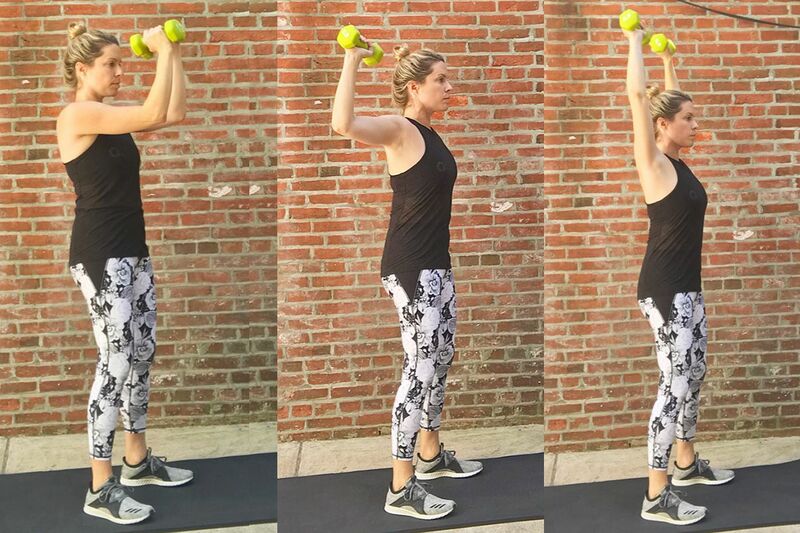 Ashley Greenblatt demonstrates a shoulder press variation. Are you put off by push-ups? Push-ups are a powerhouse exercise that enhances the entire body. In fact, in one swift movement, a single push-up can strengthen the major muscle groups located in the chest, back, core, glutes, shoulders and legs. And yet, many of us cringe at the thought of performing a push-up. Not only can push-ups be challenging and intimidating, they also can be dangerous to practice if you suffer from shoulder ailments or lower-back pain. If you've been avoiding push-ups, the following effective, efficient and safe sequence is a great alternative. All you will need are free weights and a yoga mat or carpeted surface. The chest press is versatile and adjustable to your fitness level. Do this move on a gym bench, a stability ball or even the cushiony carpet in your home. Keep the free weights nearby as you lie in a supine position on the floor, bench or ball, and bend at the knees. Firmly press your feet and lower back into the floor. Grabbing your free weights, wing your arms out to the side until they form a 90-degree angle at the shoulder joint. Carefully extend your arms until the weights are hovering above your chest. Squeeze your chest muscles tight as you bring the weights together. Hold for one count then slowly return to the starting stance. Repeat 12-15 times. Remain in the same position as above. Lift your toes and push your heels into the ground as you elevate your hips high enough to form a straight line from knees to heels. Squeeze your glutes tight. Hold this position while you perform a chest press. Repeat 12-15 times. Essentially, a push-up is a plank in motion. The following plank variation is designed to perk up your pecs and carve your core. Start in a plank position with your wrists aligned below your shoulders, hips squared and spine straight. Push-ups help to build the muscles of the back, chest, biceps, triceps and shoulders. An elbow squeeze shoulder press is a comprehensive combination that unites two exercises into one dynamic move to ensure that you hit all of the upper-body muscles used during a push-up. Start by standing tall with a free weight in each hand. Elevate your arms so your elbows form a 90-degree angle and triceps are parallel with the floor. Take a deep breath and on your exhale, bring the elbows in toward each other until you feel a stretch in your upper back. Inhale again to expand your chest as you pull the weights away from your body and pinch your shoulder blades together. From this position, lift your weights up over head into a shoulder press then lower them to that 90-degree elbow bend. Repeat these three steps 10 times.